The deluge of attacks by the 115th Congress on our health and environment are taking aim at clean air and water protections already in place—and seek to cripple future attempts to enforce environmental laws that protect our air, water, and lands. A Senate procedural vote failed, 49–51, preventing a Congressional Review Act resolution from nullifying the Bureau of Land Management’s Methane Waste Rule. The safeguards targeted for repeal have undergone years of public engagement, good government process, and scientific research. 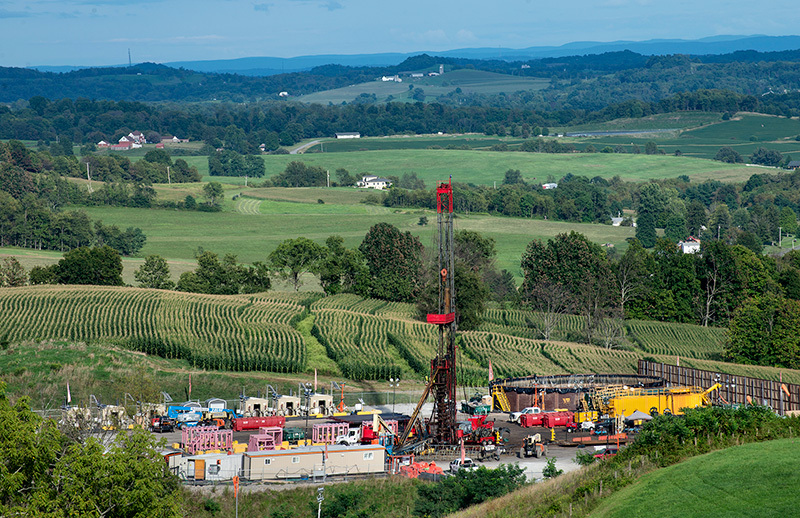 Learn about two of the safeguards targeted, BLM Methane Rule and Stream Protection Rule—and about the "Regulatory Accountability Act", a bill that would force agencies to adopt rules that are the least costly for industry, regardless of the public benefit. 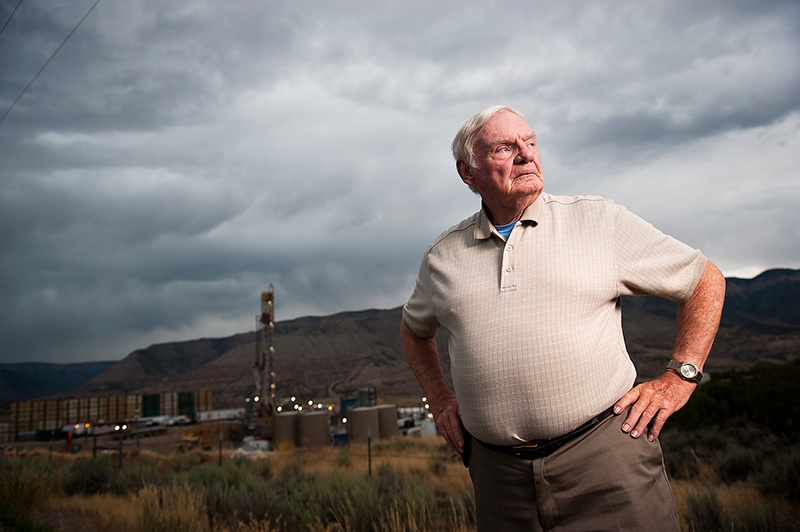 Congressional leaders attempted to unravel BLM’s Methane Rule using the Congressional Review Act. They failed. Why do we need the BLM Methane Rule? Methane is one of the most dangerous byproducts of oil and gas operations, trapping 86 times more heat in the atmosphere than carbon dioxide, fast-tracking the consequences of catastrophic climate change—from droughts and wildfires, to sea level rise and flooding. Each year, oil and gas companies leak or deliberately vent millions of tons of methane into the atmosphere during oil and gas operations. 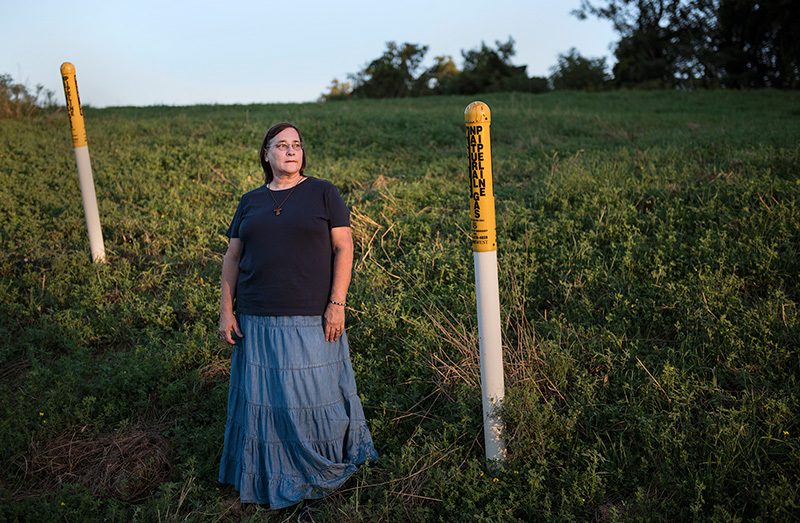 Methane pollution is often accompanied by toxic air pollutants such as benzene, formaldehyde and ethylbenzene, threatening the health of families living near oil and gas operations. 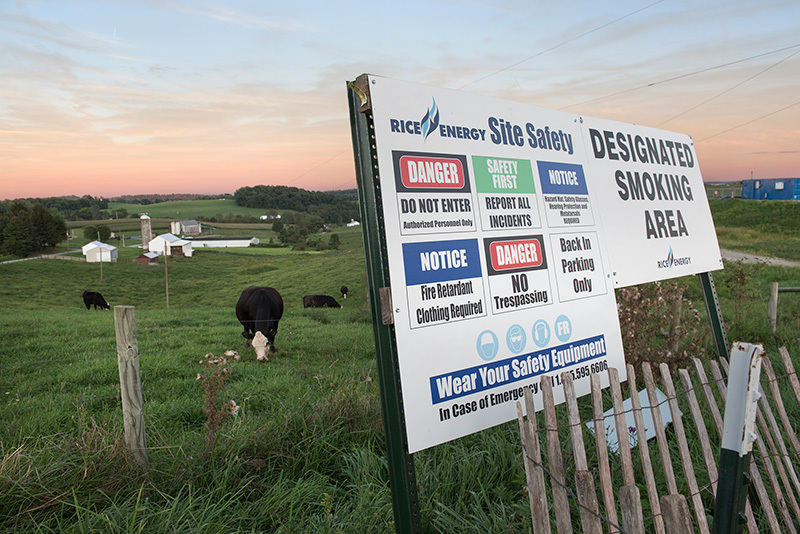 74,000 people: Who live within a half-mile of oil & gas facilities on public lands, at increased exposure to the toxic, cancer-causing air pollutants like benzene, formaldehyde and ethylbenzene emitted along with methane during oil & gas operations. $1 billion: Amount wasted every year from oil & gas equipment leaks. $330 million: Amount of taxpayer dollars that could be offset each year by royalties for the natural gas that is extracted from our public lands but burned off in flares or by failure to repair leaky equipment. What does it do? To address this dangerous and wasteful pollution, both the Bureau of Land Management and the Environmental Protection Agency developed solutions. In November, the BLM finalized a rule that requires oil and gas companies to reduce venting, flaring and leaks from industry operations on our public lands. Several months prior, the EPA had put federal safeguards in place to limit methane pollution from new sources in the oil and gas industry. Together, these crucial protections reduce air pollution, protecting the health of communities and slowing climate change. What’s happening now with this safeguard in Congress? On Feb. 3, the House approved by a vote of 221–191 a measure to undo the BLM Methane Rule using the Congressional Review Act. Legislation was also introduced in the Senate, on Jan. 30, that attempts to repeal the BLM Methane Rule. On May 10, a Senate vote to proceed to debate on the resolution failed, 49–51. "Commonsense prevailed today in the United States Congress," said Jessica Ennis, Senior Legislative Representative at Earthjustice. "By preserving this win-win rule that protects public health and saves taxpayers money at the same time, Congress is managing to slowly rebuild its credibility as an institution that can serve as a check against powerful corporate interests." If the resolution had passed both House and Senate and was signed by the President, it would have nullified the rule—and mandated that rules “substantially the same” could not be pursued in the future without an act of Congress. Earthjustice is also defending the BLM Methane Rule in court: In the latest development on the legal front, on Jan. 16, the U.S. District Court rejected a legal challenge to the rule, denying industry and states’ motion for a preliminary injunction of the BLM Methane Rule. “The court’s decision is a win for taxpayers and our environment," said Earthjustice attorney Robin Cooley, who argued the case in front of the federal court on behalf of a coalition of groups. Contact your representative by email and by phone (to their Washington, D.C., office and local district offices). Tell your member of Congress to oppose this and any use of the Congressional Review Act to weaken clean air, clean water and health protections. Undoing these safeguards undercuts good government process and leaves communities vulnerable to health and environmental harms. Congressional leadership is putting health problems, premature deaths, and environmental hazards back on the table, leaving average Americans to face health and environmental problems we shouldn’t have on our hands. Congressional leaders have eviscerated the Stream Protection Rule using the Congressional Review Act. What happened with this safeguard? By signing into law the resolution of disapproval eviscerating the Stream Protection Rule, the Trump administration has put coal industry profits over our clean water. Legislation to repeal the Stream Protection Rule using the Congressional Review Act had passed the House (228–194) on Feb. 1 and the Senate (56–42) on Feb. 2. The Senate bypassed committee review and regular order to bring this resolution to the floor. 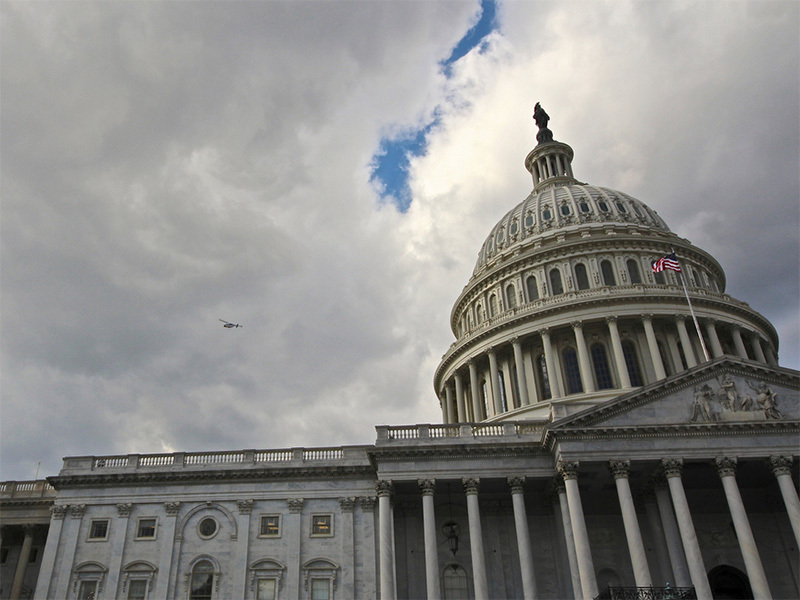 “This Congressional action is a warning shot to each of us—Congress is willing to trade our health and safety for industry profits,” said Jenifer Collins, Associate Legislative Representative at Earthjustice. "During his campaign, the President said Americans need ‘crystal clear and clean water.’ If he really meant that, he would have vetoed this legislation." Members of Congress are giving the coal industry exemptions from clean water requirements—instead of giving our kids, waterways and mountains the protections we all deserve for generations to come. 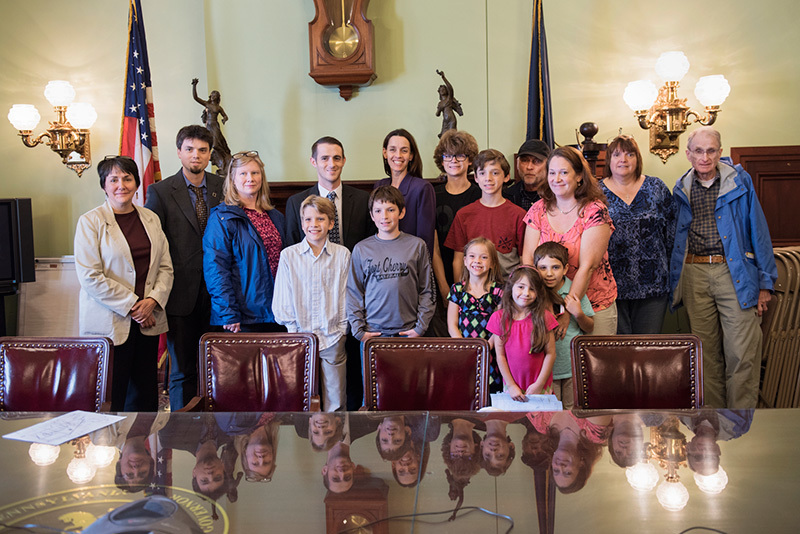 This legislative attack amounted to special treatment for coal companies, even though their mining practices are linked to serious human health problems. According to the Department of the Interior, industry compliance costs associated with the rule would have amounted to approximately 0.3% of estimated 2015 coal revenues. Getting rid of the Stream Protection Rule using the Congressional Review Act will not bring jobs back to the declining coal industry, which is facing numerous bankruptcies due to its failure to compete with other energy sources, not due to protective environmental regulations. What was the Stream Protection Rule? A commonsense protection created by the Department of the Interior to fix water pollution in rural communities caused by coal mining. It sought to ensure communities do not get stuck with the consequences of toxic water pollution from industrial coal mining operations. It would have been the first major update to surface mining regulations in 30 years. Why did we need it? Toxic mining runoff pollutes entire watersheds, devastating ecosystems and the livelihoods of those who rely on their local waterways for drinking water. 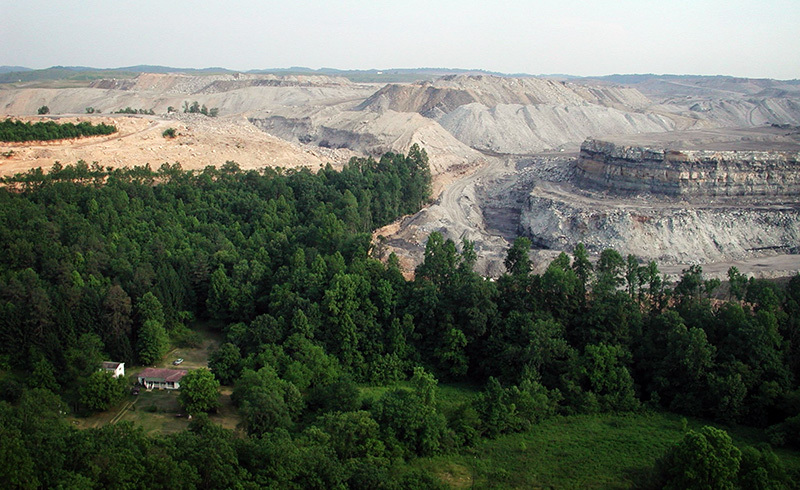 In Appalachia, where about a million acres of forest have vanished as a result of mountaintop removal coal mining, an estimated 2,000 miles of streams have been destroyed—an equivalent distance reaching from Charleston, West Virginia, to Salt Lake City, Utah. 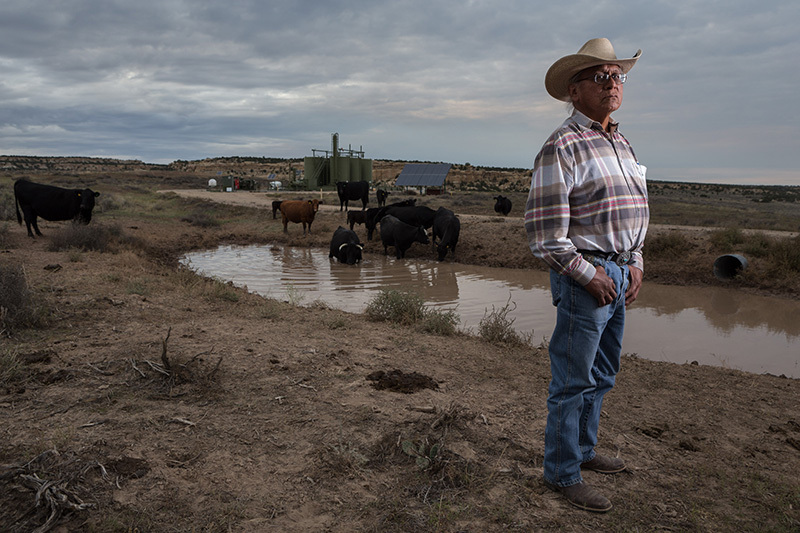 In the semi-arid West, coal mining can taint scarce water resources that farmers and ranchers depend on. In Alaska, vital salmon streams—channels that connect to the ocean fisheries we eat from—are often located in immediate proximity to coal deposits. “There’s a lot of things we can live without,” says Ron Burnett, an Alaska resident for nearly three decades. “But we can’t live without water.” Read Burnett's story and the fight against the Chuitna Mine, a project so massive that it would become one of the largest open-pit coal mines nationwide. 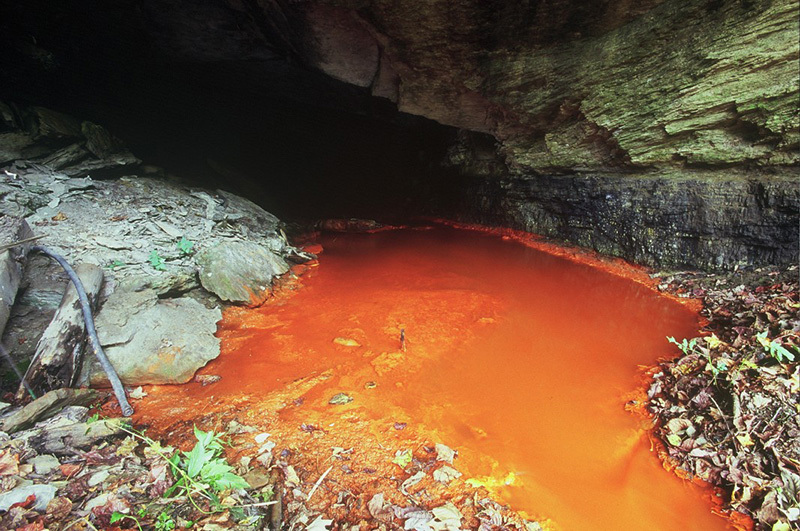 Pollution flowed from an illegal open drift mouth of an abandoned underground coal mine in West Virginia. In southern West Virginia, most of the pollution from the coal industry enters the Canawha River (a tributary of the Ohio River), eventually flowing into the Gulf of Mexico, by way of the Mississippi. 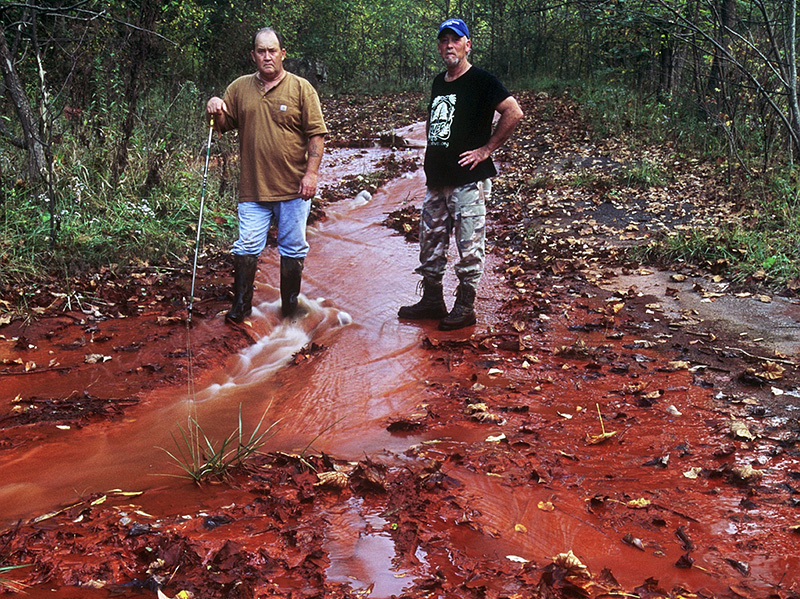 Owen Stout (left), a resident of Daws, West Virginia (farther down Cabin Creek), with anti-coal activist Chuck Nelson amid the same polluted water as the previous image. A very large valley fill near Naoma, West Virginia, in 2008. As with all valley fills, this one buried a small headwater stream, and poisoned any downstream water with residue from the explosives used in mountaintop removal coal mining. The area, now dominated by this rubble, was once forested, with numerous springs and headwater streams. A family built this home in the 1960s in what was the community of Mud, West Virginia. 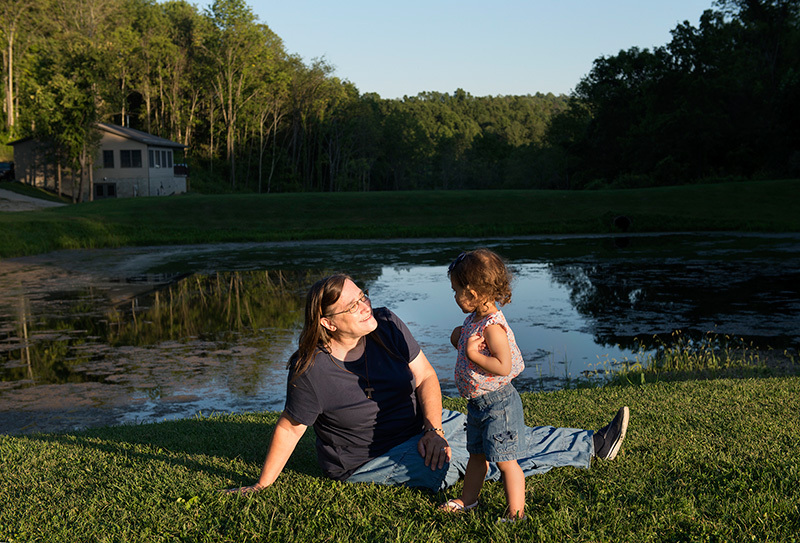 As the mountaintop removal operation moved closer, the family's well water began to go bad. They were eventually forced to leave. The town of Mud no longer exists. The Mud River, which runs in front of this house, is polluted with selenium leaching off the mountaintop removal site. 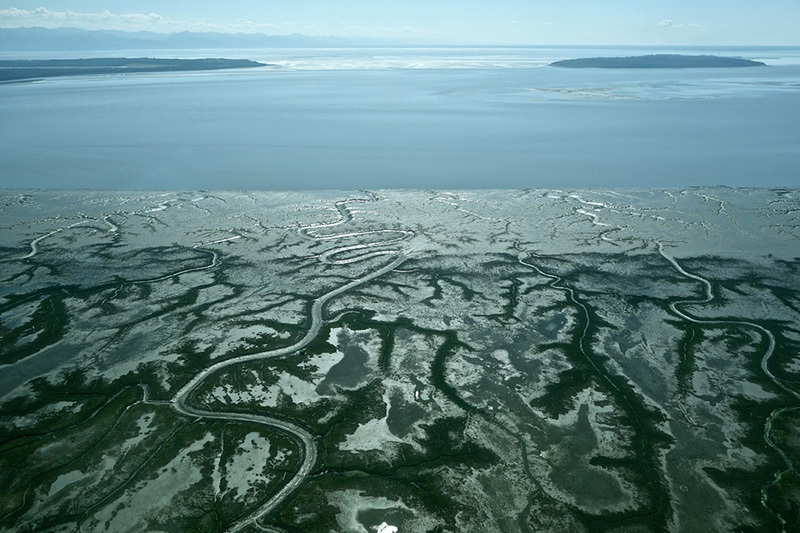 The west side of Cook Inlet is filled with water bodies. Here, and throughout Alaska, coal deposits coincide with vital salmon spawning streams. About 14 miles of these streams would be destroyed by the proposed Chuitna coal mine. What would the rule have done? Put our country on track to protect and restore some 6,000 miles of polluted streams and rivers from harmful toxins. It also would have required monitoring to detect harmful chemicals in surface water and groundwater—information that’s crucial for the communities whose backyards have been transformed by coal mining. Safeguards under the Stream Protection Rule would have extended to anywhere coal-mining operations are proposed or underway. How was it developed? 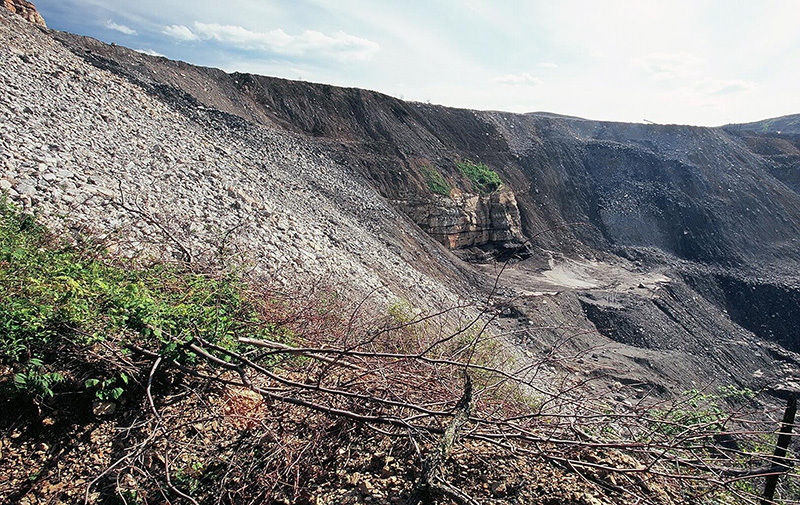 Through more than eight years of public engagement and scientific research: dozens of peer-reviewed studies link mountaintop removal mining with health impacts including cancer and birth defects. Earthjustice has also been working to defend the Stream Protection Rule in court: In the latest development on the legal front, on Jan. 18 and Jan. 20, a coalition of local and national community and conservation groups filed motions to be allowed to help defend the national Stream Protection Rule against three lawsuits. We must stand up for the safeguards that protect our families. Call your senators and tell them to oppose oppose any use of the Congressional Review Act to weaken clean air, clean water and health protections. The Senate is now attempting to use the Congressional Review Act to eviscerate the BLM Methane Rule. Senators could vote as early as the week of Feb. 27. People deserve transparency in the political process. The Congressional Review Act is an extreme, blunt instrument that would do permanent damage to surface mining law and is an attack on an essential safeguard. The so-called “Regulatory Accountability Act” would mire in quicksand government agencies that seek to use peer-reviewed science and public engagement to create vital protections for our communities. What is the so-called “Regulatory Accountability Act”? It seeks to significantly complicate and slow down federal agencies in making new rules to protect our health, environment, and civil rights. Instead of creating a more accountable regulatory process, the "Regulatory Accountability Act" would paralyze government agencies and prevent them from providing clean water, clean air, and a safe and healthy environment for Americans. The result would be a gummed up, slowed-down American government unable to protect its people. What would it do? Require more than 70 burdensome new steps in the regulatory process and force agencies to adopt rules that are the least costly for industry, regardless of the public benefit or an urgent need for community protections. This is a cash giveaway to the wealthy few, leaving average families to suffer. We’ve seen this kind of terrible government process at work before. The Toxic Substances Control Act of 1976 contained a similar requirement, which had the effect of blocking the EPA from regulating even a single toxic chemical for decades until the law was updated last year. What’s happening now with this bill in Congress? The bill passed the House (238–183) on Jan. 11. It was received in the Senate on Jan. 12 and referred to the Senate Committee on Homeland Security and Governmental Affairs. Contact your representative by email and by phone (to their Washington, D.C., office and local district offices). Tell them to oppose the so-called "Regulatory Accountability Act." The bill is a blatant attempt to shift the focus of government agencies away from public safeguards for the environment, civil rights, and workers, and toward cynical calculations of financial benefits for wealthy corporations. Decades after the Cuyahoga River caught on fire and thick smog turned days into nights, huge strides have been made in restoring our clean water and air, thanks to our strong environmental laws. Clean air and clean water are essential for the good health of all Americans. Our laws can continue to work for us—if we fight to keep them strong.